Over the past weekend I've been at Drupalcamp London, and as per the other two I've been to it was fantastic. I saw lots of good people: some I already knew, but also making some new contacts. We talked about all sorts of Drupal-related topics—and not all particularly about code, as you can see below—but also saw a good few talks from some really interesting speakers. Here's a summary of the track I followed through my own personal Drupalcamp. This was only a small fraction of the whole camp, so you can imagine how much you yourself could get out of your own next Drupalcamp, and you should get a ticket for one near you today! Inclusivity and diversity are subjects that tech is finally waking up to, within its own field: witness gaming's battles with misogyny, or the experiences of PoC within tech. Within that context, it's really useful to hear about experiences from groups that have long and unfairly been marginalized in this way. Mike Bell volunteered to give the most courageous talk I've heard, on his long battle with ME/CFS, culimating in a breakdown and use of the UK's mental health services (generally pretty good, although he presented something of a user's guide to them!) It was simultaneously an eye-opener, a warning, a plan of action (just in case the worst happens), and a call to everyone present to take better care of themselves and their colleagues. It takes a lot of strength to be able to turn such difficult, life-changing experiences into something so welcome: the honesty alone felt very much like water on parched earth. Our industry needs to be open about this stuff! Dr Sue Black also spoke about social issues, but with more of a tech-enabling slant. Among the many strings to her bow is a fanatical devotion to getting mothers more comfortable with technology, having seen both how her own experiences have ultimately changed her life and expanded her horizons, and also the statistics on how improving parent literacy also drastically improves that of their children. She spoke of the past successes of the "#techmums" project and its exciting future. Personally I'd love to see the project expanded to other excluded groups, but Sue acknowledged that: it's clear that "two fixes in one" is the hook that's getting traction for this project, and with luck it can bring other similar projects along in its wake. ​I continued my gradual trend towards more, yet lower-key, socializing, by attending a couple of Birds of a Feather discussions: one on how regionalized user groups can communicate better with each other; another on how we plan Drupalcon Barcelona's Tour de Drupal. 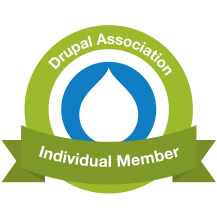 The first shows Drupal as a "lucky" victim of its own success: user groups are now getting so popular that they accidentally plan conflicting events, so we chatted about how we could organize that better. And the second is a phenomenon unique to Drupal as far as I'm aware: people who come together for the technology, but then genuinely stay on for the "community"; what else would you call a bunch of cyclists planning a fun trip through the Pyrenees? In the evening, I again took the lower-key route and went for a quiet meal rather than the music-heavy social event. I've nothing against that event happening, but it's just not for me any more: too loud, too dark, too drunken. From the experience of having a nicer evening doing other things, though, there's now discussion about having quieter alternative socials at future camps: drink teas; chat amiably; bring beer and takeaways if you like; with calming lighting, lots of cushions and just enough wifi...! Having been to a lot of developer talks in the past, and also being in the position of starting my own company in the next month, I wanted to get more of an idea of what people were saying about process and how they apply it to their own Drupal projects. It was therefore good to hear Ben Wilding talking about "Consultancy 101", and how he takes a (politely) questioning approach to new clients. I've always wanted clients to come to me with problems rather than solutions (however eager the savvier clients are to work out the technical approach themselves) and to have a few tools with which to do that, and the confidence that these tools are being used in the field, is really useful. Seeing him take a forking, discursive route through the 5 Whys was especially illuminating. Later on in the Saturday, Emma Jane Hogbin gave us another "tales from the trenches" talk, this time on Drupal-friendly project management, by looking at workflows from the developer perspective and using that to inform how work can be successfully and efficiently passed around the conveyor belts of process without dropping off the end of one of them, or bumping against the sides. I particularly like the stress on encapsulation—even theoretical—whereby PMs and developers hand work around rather than doing others' jobs, and how that then informs how-to-demo or UAT writing that doesn't try to "catch out" the developer. Also interesting was hearing someone for whom Features (still) explodes: I've had a lot of good experiences with it recently, so a heads-up that the minefield is still out there is pretty timely. Robert Douglass gave a great his keynote on "Orchestrated, Consistent and Deterministic," which exposed many of our lazy habits when it comes to deployment. It's clear that unless you're starting the project yourself, you're limited in how much of the methodology you can realistically bring to bear on something you've inherit—even Robert said that some of the problems inherent in establishing a perfect workflow along the lines of this methodology were not yet solved, even by experts in the field—but such a methodology gives us something to aim for. That in turn helps us have those awkward conversations with clients: this is why things are difficult right now; this is how we could start to fix them; having this methodology on our horizon gives us some hope! It's been around for a while now, but Drupal console is really getting into its stride, especially as a scaffolding tool for Drupal 8. Eduardo Garcia took it through its paces, with a number of pre-recorded, very snappy demos of what it can do for us. Simultaneously a development tool—stubbing out controllers, routes, and even form API—and also a learning tool—figuring out where files should go, and how things are best done—console looks like it's an essential adjunct to D8 development. Its addition of a handful of "site health" commands (essential for its own debugging) places it as a possible alternative to Drush, although both projects are in very healthy discussion with each other, and don't see competition so much as complementarity in the months ahead. Vicky Teinaki did a great summary talk of both module configurations and also broader techniques, for drastically improving the user experience of Drupal. UX and usability testing more generally are spotlights you can shine on the darker corners of a site's user interactions, and it was great to see someone being simultaneously critical of what they found, but also offering lots of solutions that could be straightforwardly implemented to really lift Drupal's out-of-the-box UX to a higher plane. I'm hoping to take basically all of her suggestions and weave them into my next install profile, so they're available from the very beginning. Finally, Johan Gant talked about using Wraith, a tool developed by the BBC's own in-house teams to provide visually heavy, rapid BDD testing. By rendering crucial webpages for you, before and after what you think are small changes, Wraith is able to compare the results and show (through visual XORing) what has and hasn't actually altered for the end user. While focussing on the visuals isn't always instructive, it can nonetheless very quickly show you when merely tweaking the CSS for listing X has done substantial damage to the layout of listing Y that you never even thought of. Like all testing systems, it benefits most from being embedded in automation, but it's certainly one to watch alongside the more workflowing methodologies like Behat's. All in all it was a great camp, and I must thank the many sponsors—especially the BBC and City University London—along with the organizers and speakers, for making it possible to run on such a low ticket price for yet another year. It means a lot, especially for sole traders with partners and cats to feed. I wish I'd been there for the CxO day on the Friday, and I wish I'd been able to go to more sessions, and I half-wish I'd brought my laptop along so I could help with the Sunday afternoon code sprints.... But mostly I'm wishing that 2016's Drupalcamp London will be just as great, despite some of the team stepping down. But camps are what we all make of them, and so maybe it's also up to us. Tea on the sofas, anyone?